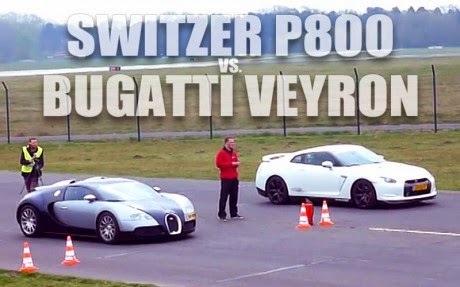 Nissan GT-R vs Bugatti Veyron. It's cool to have the $100k car beat the 2 million? dollar car. The Bugatti is still an awesome piece of machinery and deserves some respect. Also check out a bonus video against a modified Nissan Skyline GT-R - R34. Imagine our surprise, then, when a Mansory-tuned Bugatti Veyron showed up at a European tuner side-by-side event and (after polishing off a 1200 HP Grand Sport Vitesse) was willing to race a Switzer P800 GTR prepared by our European distributors, TotalCar Concept!